The Ferguson grand jury handed down their decision in the Michael Brown case, deciding not to indict officer Darren Wilson. Officials have not pegged a specific date but the have said that the decision on officer Darren Wilson should come by the end of the month at the latest. The grand jury’s decision could literally come any day now as some believed that it would come through last weekend. St. Louis County prosecutor Bob McCulloch said his office will give a 24-hour notice if a decision is expected to be announced during a weekend, and a three-hour notice if the decision is handed down on a weekday. He confirmed that a decision should come any day now. Tension in Ferguson has been fueled be leaks suggesting that the grand jury may have already made a decision before hearing all of the evidence, although McCulloch has said that such a notion is “rank speculation” and that the jury was still hearing evidence. Wilson testified before the grand jury in September, and the jury has heard from a host of others including New York City Chief Medical Examiner Dr. Michael Baden, who performed an autopsy on Brown at the request of Brown’s family. His autopsy and the official autopsy appeared to differ on one key point–“Baden said there was no gunpowder residue on Brown’s body, indicating he was not shot at close range, though he said at the time he wasn’t given access to Brown’s clothing and the residue could be there,” explained Fox News. The official autopsy showed that one wound, to Brown’s thumb, was at close range. Wilson told investigators that he felt threatened while fighting with Brown inside a police SUV, where an initial gunshot was reportedly fired. Wilson said that Brown scratched and punched him multiple times. Baden’s autopsy showed that Brown was shot at least six times, with the one to the head killing him. The grand jury is taking an unusual approach to the high-profile case, noted the Washington Post. “Instead of telling grand jury members what charges they believe police officer Darren Wilson should face, they are leaving it open-ended for now and involving the grand jury as co-investigators,” the Post said in September. “The prosecutor’s office is also presenting evidence to the grand jury as soon as it receives it, rather than waiting until the St. Louis County Police Department and the FBI have completed their investigations. Police probes are typically completed before a case is presented to a grand jury, county officials said. In addition to hearing from Wilson, the jury heard from Dorian Johnson, Brown’s friend who was there when he died. Susan W. McGraugh, a criminal-defense lawyer and a professor at the Saint Louis University School of Law, said that the approach is allowed under the law and that prosecutors sometimes use it in high-profile cases. Grand juries have historically been known as “the voice of the community” or “the people’s panel,” notes the University of Dayton‘s School of Law. Grand juries typically listen and observe as a prosecutor presents evidence trying to persuade them that the person or people that he or she wants to charge has committed crimes. Evidence can be almost anything, including testimony from witnesses, video recordings, and the results of scientific tests such as DNA tests. After all of the evidence has been presented, the jurors vote on the proposed charges–known as the “indictment”–which the prosecutor has drafted and given to them. Unlike some court cases, the grand jury need only have the majority to pass an indictment. But if a majority doesn’t think that the prosecutor’s evidence creates probable cause, then they will vote not to return the indictment, and no criminal case will result from it. However, in that case another case could be brought against the defendant since “double jeopardy” doesn’t apply. 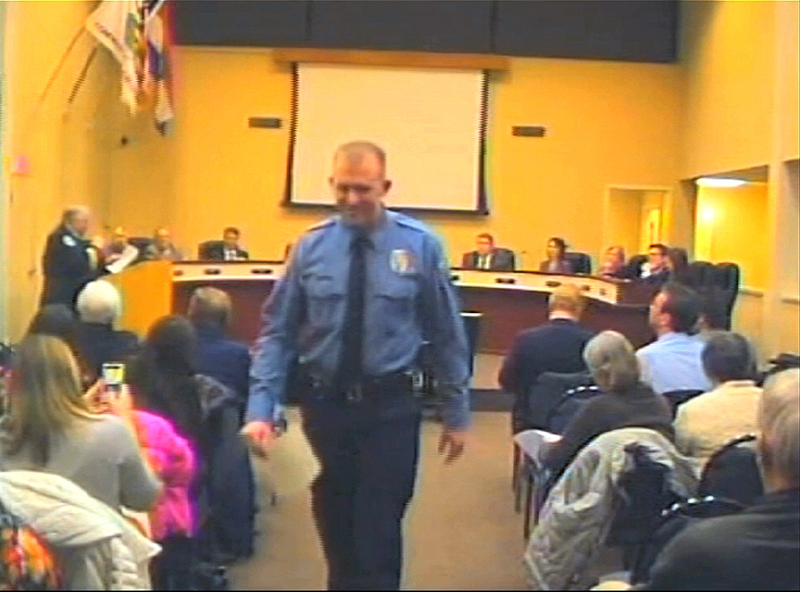 If Wilson is not indicted, he may be able to return to the Ferguson Police Department. “I am not saying that I want Officer Wilson to return or that I don’t want him to return,”Ferguson Police Chief Thomas Jackson told msnbc. “But even if he is not indicted he will be subject to an internal investigation,” Jackson added. The results of that investigation, according to Jackson, may or may not lead to Wilson’s termination. 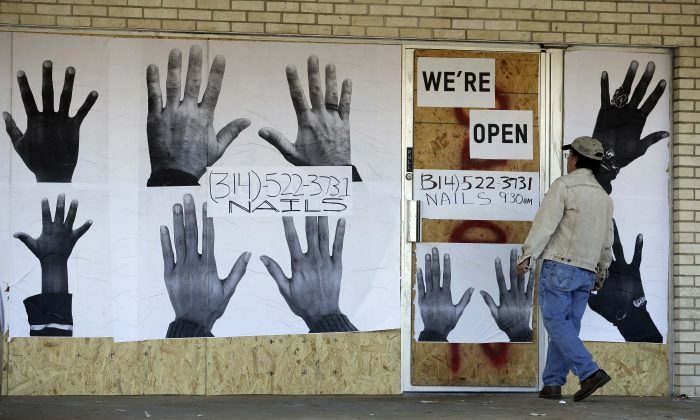 Many longtime Ferguson residents support the police, and claim to be unaware there were any racial tensions. 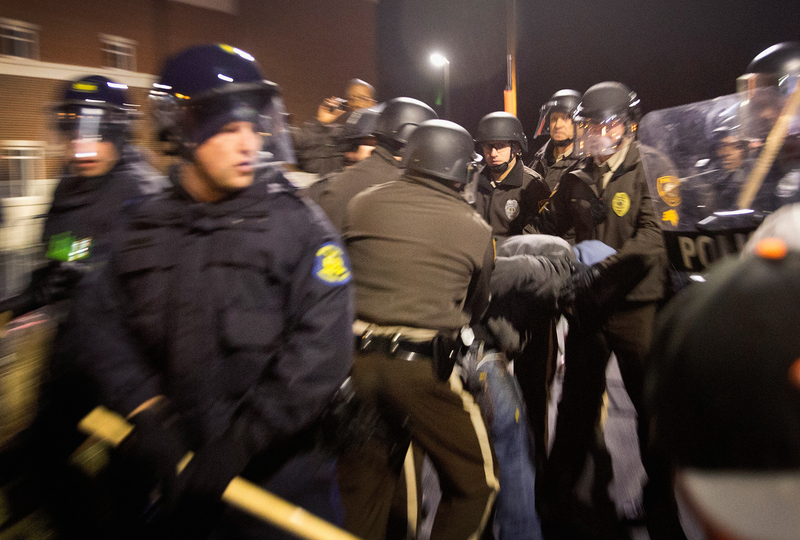 About 40 protesters and 30 police in riot gear clashed outside the police department in Ferguson Wednesday night. At least two protesters were arrested.